Project Steps: Cool Gadget for Thirty Bucks! Cool Gadget for Thirty Bucks! 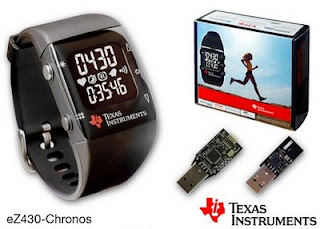 Texas Instruments (TI) introduces the eZ430-Chronos, which is the world’s first customizable development environment within a sports watch. Taking the popular line of eZ430 development tools to the next level, the kit allowsdevelopers to easily harness the leading integration, ultra-low power and wireless capabilities of TI’s CC430 microcontroller (MCU).